It was the underlying buzz of HP Discover. The tablet known as TouchPad – a WebOS tablet that could match the others. We got to see it… And touch it. Tim Pettitt, HP Project Manager for Palm, gave the Blogger Lounge some special treatment as he came over with the TouchPad, a Pre 3, the charge dock and a Bluetooth keyboard. Watching the demonstration was pretty impressive. First of all, Tim showed how you can use the dock stand to charge. There is no plug per say, so however you place the tablet on the stand, it charges. Tim put the Pre 3 up to the tablet. It found the device, created a connection and transfered data. When Tim connected the keyboard, the same ease of use was present. The TouchPad is a 1.6 pound, 9.7″ tablet. With a Snapdragon processor running dual-core 1.6 GHz, it can outperform the iPad. The screen is 18 bit color with resolutions to 1024×768. They will first come out with WiFi only models, followed by 3G through multiple carriers. Although Tim could not say a release date, it may seem that Amazon.com slipped out a July 17th release (This is only a rumor, though*[See update at top]). You can be notified when the HP TouchPad becomes available. 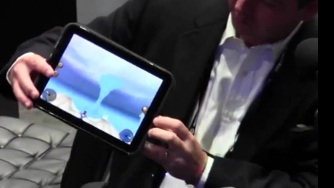 The following is the Blogger roundtable of Tim’s presentation to the HP TouchPad. We also got to see and play a couple games on the device.